Have you taken a look at your sofa recently? The sofa is a key piece of the living room, but it’s something that most of us don’t think about. When we get home from a long, hard day at the office, we plonk ourselves down on the sofa and stare at the TV. The sofa could be black leather, lime green, or covered with a pink polka-dot pattern and we probably wouldn’t care, as long as it was comfy. Some interior designers have decided that it’s time for sofas to stand up (metaphorically) and be noticed. Check out these special sofas with designs that you could never overlook. Are you sick of telling your kids to move their stuffed toys? If you had this sofa, the toys would blend in un-noticed. 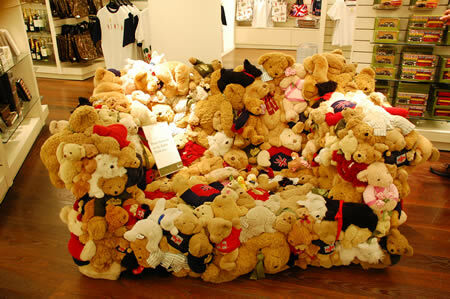 Every square inch of it is occupied by stuffed toys heaped on top of each other. Personally, I’m not sure if I’d want to sit on it. Partly because it looks a little lumpy, and partly because I’d feel guilty squashing so many cute teddy bears. With that said, it certainly makes a good talking point! This is another sofa that doesn’t look that ideal for sitting on – but it’s certainly one that you wouldn’t just ignore. The catcus sofa looks like several cacti stuck together, and it has spikes too. This is definitely a case of “When sofas fight back”. This particular sofa looks, quite literally, good enough to eat. It looks like a bowl of mints and candy, and each brightly coloured cushion looks soft and comfortable. This particular sofa consists of 49 balls. The outer nine are filled with a low density foam, and the other balls are filled with high density foam. You can move the balls around, squeeze them into gaps, and tweak the design of the sofa for maximum comfort. The only downside to this particular sofa is that it’s white, so it’s probably annoying to keep clean. Cross sofas are designed to be played with and re-arranged. The sofa is made of two components, one red, and one white. You can move them around and fold them up in various ways. It’s a nice idea, as long as you’re not the kind of person that struggles with folding chairs and dining room tables. If you enjoy science fiction, then Jonas Jurgaitis’ alien sofa would make a great talking point in your home. The sofa has a futuristic design, with the seat and the sofa back made up of alien “tentacles”. The brush sofa is designed to look like the head of a toothbrush. The seat part of it is rather low down, but the toothbrush “bristles” are soft and flexible. It would be a great sofa to sleep on, or to lounge on beanbag style, but it probably wouldn’t work well for day to day seating. Written by Amy Fowler on behalf of suppliers of sofas in Nottingham and sofas in Derby, The Suite Company. View their product range here. LOL Maybe cause I’m almost Forty-Ten, yes Forty-Ten! I refuse to turn Fifty I will just stick with my black leather couch! @crubin True, true! Although I’m more of a Maltesers fan myself…uuuuuuhm, Maltesers! And somebody took the time to design all these? You could try the cactus sofa if you ever had an overpowering desire to know what it is to suffer from hemorrhoids or it could replace the more typical bed of nails for the Indian mystic. Those are all inventive suggestions. 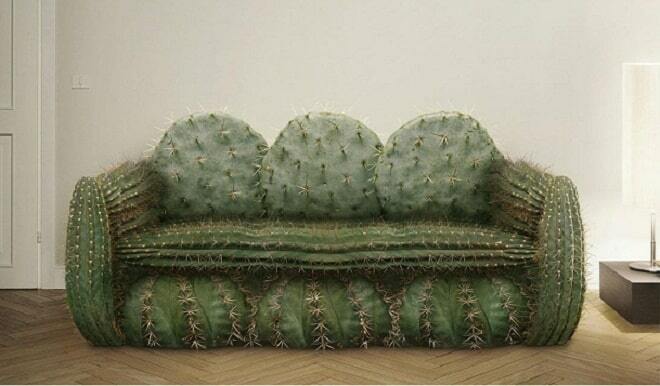 But by far the best practical use of the Cactus Sofa is to get rid of unwanted guests! @Daniel Nest Good thinking!? You might want to cover it with a sofa throw first, unless it is a really dumb guest. The dumbest guests are the most unwanted ones? @Daniel Nest True? Why do we keep using question marks?? @Daniel Nest Maybe, that is it?